I started baking for the very first time around the same time I began to blog. As I didn’t see myself using eggs in baking, bananas were the default substitute in my egg-less baking adventures and experiments. Since then, I must have baked banana based cakes and loaves god-knows-how-many times. I feel forever thankful to the humble banana for ushering me into the wonderland of baking. Whenever bananas in the fruit bowl appear over ripe, it is the same two or three banana bread recipes that I have been repeatedly baking over the past few years. Then one day, while I was making Rasayana – a typical South Indian sweetened fruit salad made of bananas, freshly grated coconut and jaggery, there was a light bulb moment! We were eating Rasayana and banana breads often. What if we mixed the two? What would the outcome be? After three trials, I can say this is the best hybrid that could come out of the union of those two recipes. The best makeover ripe bananas could get – a fresh lease of life! It is a tale of Rasayana walking into a bakery and coming out a muffin/cake out of the oven. 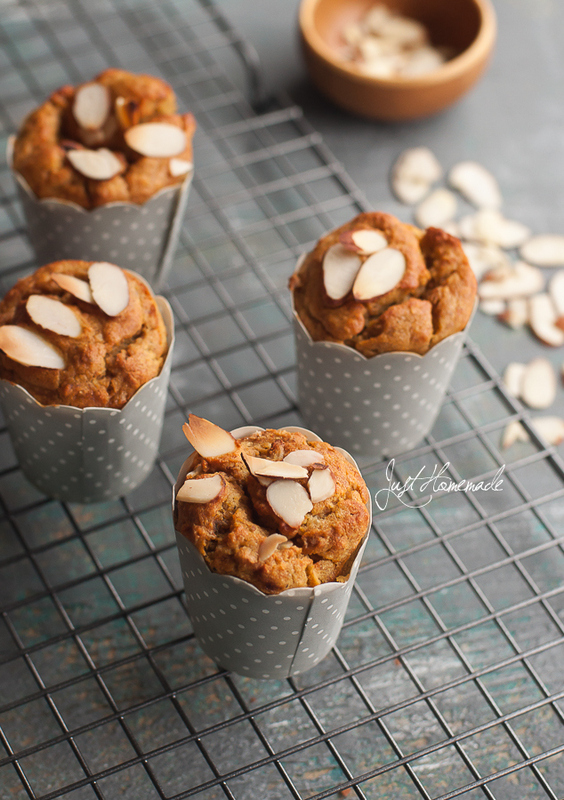 Moist and fluffy (for a whole wheat bake) with a hint of coconut and cardamom, accentuated by the mesmerizing aroma of saffron and slivered almonds in every bite, it is a real treat this Rasayana inspired muffin. Cardamom almost always paired with saffron in many South Indian sweet concoctions along with jaggery and ghee makes a heavenly combination. Don’t omit the salt. It is an essential leveler to even out the sweetness. All in all, the ingredients blend in perfect harmony. Saffron, the queen of all spices and the most seductive and the most expensive of them all is also our any time favorite. She shines bright in this recipe giving an ordinary banana muffin an elite twist fit for the holidays. Within minutes of making, half of them had vanished. Just like that. They are great for tea time, as an after school snack, in the lunch box or to fix a sweet craving. 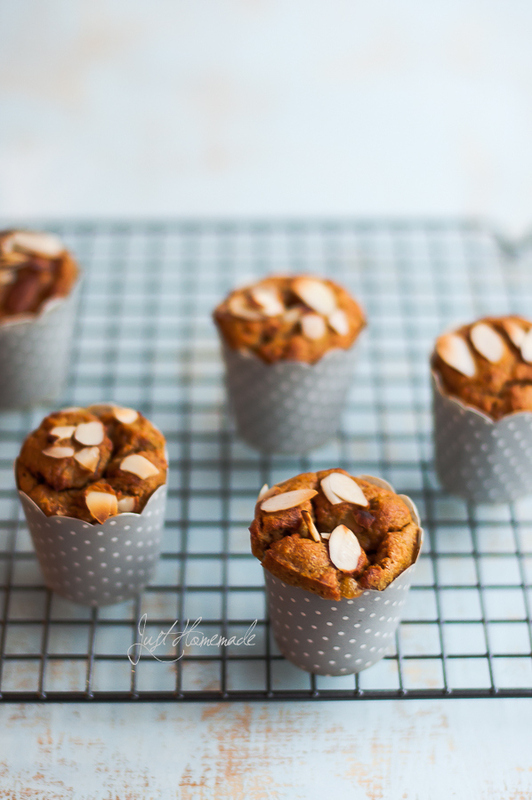 The small paper muffin cups make for the right portion size to indulge in. Not more, not less. All of us have a recipe or two for banana bread. Who needs another banana yada yada, right? Well, these Rasayana muffins might just make you think twice. 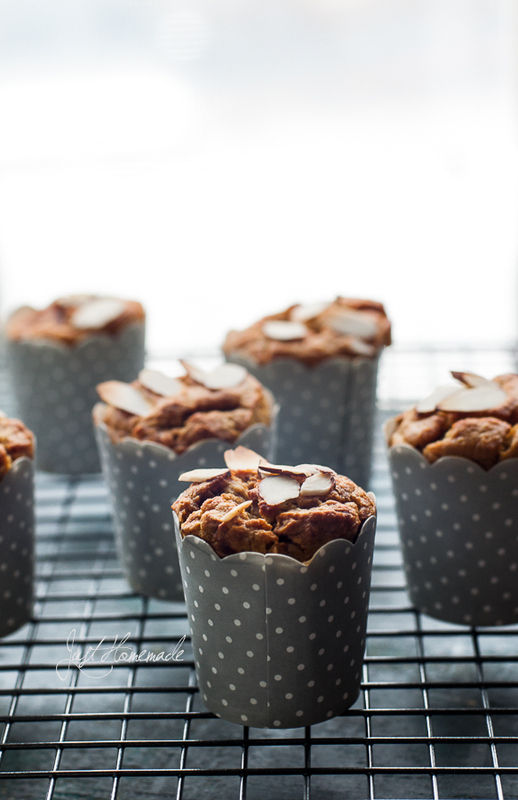 Line paper muffin cups on a baking tray and keep aside. 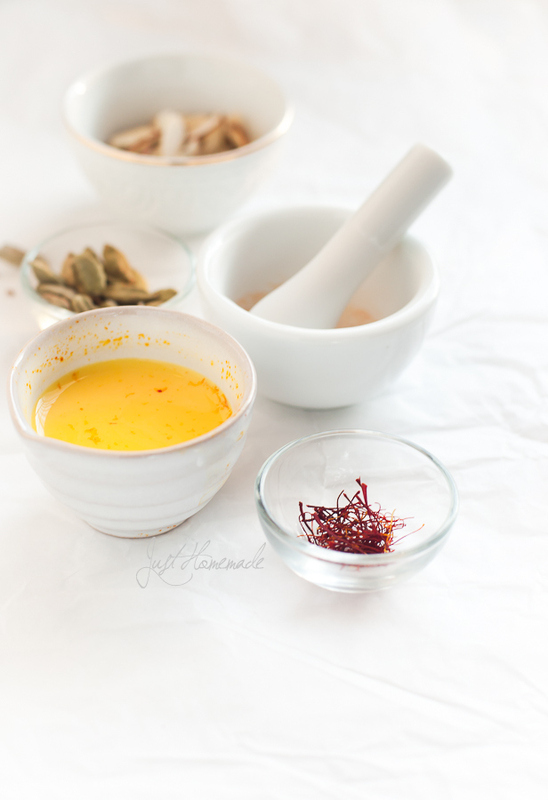 Powder saffron in a mortar and pestle. Sprinkle saffron powder to milk and stir well. In a separate mixing bowl, whisk all the dry ingredients to mix well. Add the dry mix to the wet mix and gently whisk to combine. Fold in desiccated coconut and slivered almonds. Scoop out batter into the paper muffin cups until 3/4th full leaving room for the muffins to rise. Garnish with slivered almonds pressing them gently to stay put. Place the baking tray in the middle rack of the oven and bake at 350°F for 25 mins or until tooth pick comes out clean and the irresistible aroma fills the kitchen. Do not over bake. Take muffins out of the oven and allow to cool on a wire rack. Serve warm at tea time or with a side of your favorite ice cream. It is great to eat on its own. Keep all the ingredients ready on the kitchen counter and then preheat the oven. This saves time and electricity bill. Make sure to use good quality jaggery free of common impurities like sand. If you don't have paper muffin cups, 6 inch round pan can be used for the entire batter. This looks so beautiful, I’m loving the pictures. This sounds like a really good idea, I’ll pin this to try soon. Thanks Kana 🙂 There was no time to style between the time the muffins came out of the oven and the sun getting ready to set! I must say unique combinations. Next time when bananas are ripening I will try this interesting recipe. These look beautiful and sound so delicious. Though I’m not sure I’ve even seen any powdered jaggery in the supermarket, is this something I would find in an Indian specialty store? Yes. Powdered jaggery is available at Indian stores. I usually buy the lump jaggery and powder it as and when needed. Suit yourself based on how much you’d use jaggery otherwise. If you are using for the first time, it takes similar to dark brown sugar. Your muffins look scrumptious! What a great flavor combination???? Great minds think alike! I posted some Ramayana inspired Apple, coconut and jaggery hand pies some time ago 🙂 these muffins look scrumptious and I can’t wait to try them out. This is the most innovative post I ve ever read. And never knew that Fruit Pachadi is called Rasayana. Romba Nanna irukku Radhika. Thank you Sowmya.. So glad that you like it. Hope you give it a try sometime and that I’ll see you around..
Hello ! Ooh, this looks scrumptious. 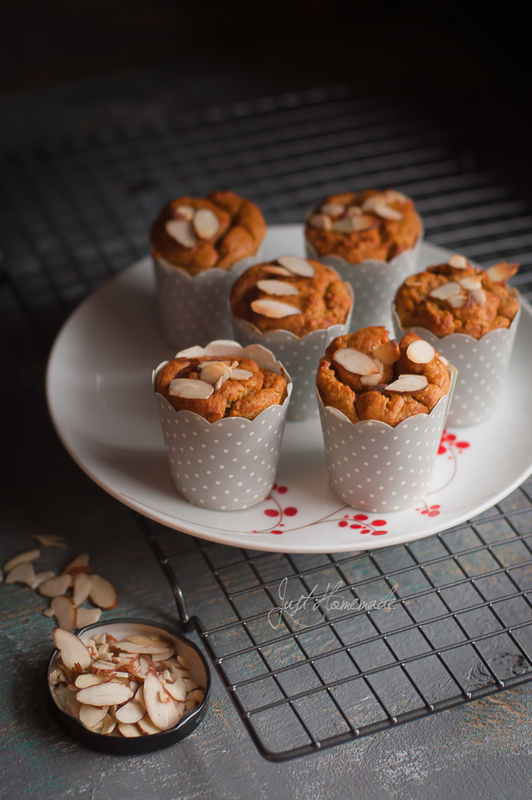 This is one of my favourite recipe I love the idea of a banana coconut saffron muffins. I’m so glad I stumbled across your blog. I’m sure to be back for more. It looks gorgeous and it is unique. Thanks for sharing.